We are leading Squirrel Cage Motor Type Cable Reeling Drum, manufacturers, suppliers and exporters located in Ambarnath MIDC Dist Thane, Maharshtra India. Torque Motor Operated Cable Reeling Drum suitable for handling lengths of cables in excess of those which can be handled by a conventional spring operated types. The units are totally enclosed and weatherproof. The torque motors are capable of operating continuously in the stalled position or of being rotated against normal phase rotation. In other words acting like a spring of infinite length. The motors have an integrally mounted electro-magnetic brake which is D.C. operated through a built in rectifier. Normal motor supply is 400/440 volts 3 phase, 50 Hz . The drive to the reel is by means of chains and sprockets, with single or double reduction accordingly to requirements. They can handle length up to 150 Mtrs multicore cables can be used. The access to the weatherproof sliprings and brush gear is by means of an easily removable cover situated at the non driving end of the reel. These units are specially designed for automatically handling trailing cables supplying power to the long travel motion on overhead and gantry cranes. Motors used are squirrel cage as well as slipring construction. 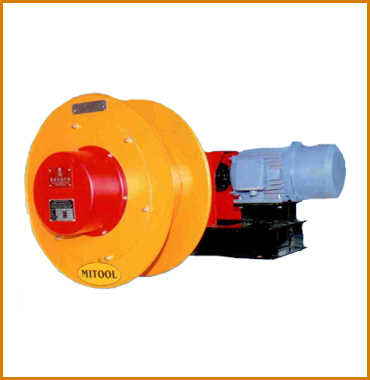 Selection of motor is depends upon torque requirement. Output torque of motor can be reduced in the slipring motor by increasing the rotor resistance.